Someone will be available to pray with you at the side altar during Communion should you wish to pray about anything. St Paul’s Woodford Bridge exists to worship God, lead people to Christ, build a loving Christian community, and serve a world in need. Looking to host a weekend event? See hiring St Paul’s church halls. A lot happens at St. Paul’s during a year and every year we hold an Annual Parochial Church Meeting (APCM) to review the previous year. This year our APCM will be in church at 11.15 on Sunday 28th April. You can find out just what’s been going on by downloading our APCM Booklet (officially, the Annual Report and Financial Statements of the PCC for 2018). Sign up to easyfundraising and help us raise FREE funds for St Paul’s Church Toilet Fund when you’re doing your everyday shopping online — it doesn't cost you anything. When you raise your first £5, easyfundraising will match it. This short video about easyfundraising explains how simple it is to use. Sign up using our unique easyfundraising invite link. For further information contact Churchwarden Paul Malam. The safeguarding policy for St Paul’s agreed by the PCC, including a list of contacts for safeguarding issues, is now available on this site and is linked from the “About Us” menu. In the Spring 2019 edition of ‘Good News!’ Magazine, Vicar Ola writes about the Gospels and Holy Week, Mac Leonard explains why Easter is so important, Len Stevens introduces himself as the new Branch Leader of St Paul’s Mothers’ Union and Vera Hunt gives an update on Redbridge foodbank and Redbrige Voluntary Care. At the moment we have no toilets in the church building - the nearest are at the bottom of the churchyard in the church hall. This is very inconvenient for baptisms, weddings, funerals, and other church services and social activities beneficial to the local community. So we’re planning to have two toilet cubicles, one fully accessible for mobility impaired users, installed in church at a cost of around £80,000 - costing this much largely because the church buildig hasn't got a sewer pipe outlet and the nearest connection for one to be laid is at the church hall. contact St Paul’s Treasurer Len Stevens for further information. See our Calendar for further details. 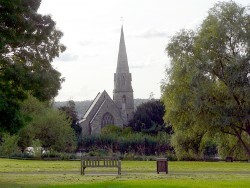 We are a Christian Parish Church in Essex in the Diocese of Chelmsford, and part of the Church of England. We are here to spread the ‘Good News’ about God and his Son Jesus Christ. The Bible says “For God loved the world so much that he gave his only son, so that everyone who believes in him may not die but may have eternal life” (John 3:16). That means those who ‘follow’ Jesus Christ, who love his company, respect his teaching, trust his promises and are prepared to let this affect their lives. The PCC has adopted the Church of England’s policies and best practice on safeguarding. Our safeguarding policy including contact details for safeguarding issues can be found from the “About Us” menu on this site. Our Parish Safeguarding Officer is Joanna Urbanek. Contact the Vicar to arrange a baptism, wedding or funeral. We are a friendly church and you will find a warm welcome at our services and church groups. For children, we have a Children’s Sunday Church Club every Sunday at 10:00 in the hall, we run Children’s Holiday Clubs and we have a Christian Playgroup which runs each morning in our Church Hall. For Senior Citizens, we run a Seniors’ Coffee morning on the first Thursday in each month. We have an active Mothers’ Union and our Textile Group has created inspiring and colourful banners for the church and meets fortnightly. “Just for Girls” meet fortnightly on a Tuesday morning from 10—12 noon for Worship, Meditation, Prayer and Fellowship. The group is open to women who are members of St Paul’s church. Please contact Pauline Bolding for further details. St Paul’s welcomes anyone who is disabled - our Church has disabled access facilities through the South Door off the Main road, and a hearing loop for anyone using a hearing aid. Light up St Paul’s Spire! Everyone is invited to participate in our Spirelight Dedication, to commemorate an Anniversary, Birthday or any other memorable date. Forms in Church or from Len Stevens.